Exact error when running “Test Map” in Visual Studio: Does not contain a matching ‘GetTimestamp’ method that has 0 parameter(s). I was transferring a BizTalk map from 2010 to 2013. It turns out in my particular case, the function name didn’t actually match, the “s” of “GetTimeStamp” either needed to be capitalized or lower case in both places where it is used. This blog also shows how to get the time within an XSLT function (in a BizTalk map). BizTalk Test Map: error btm1044: Input validation error: Could not find schema information for the element ‘http://Namespace/:ElementName. error btm1044: Input validation error: Could not find schema information for the element ‘http://Namespace/:ElementName. Visual Studio Solution Explorer allows you to right-click on a .btm map and specify a property called “TestMap Input Instance”. If you specify a file that totally doesn’t match the expected schema, then you can receive the error above. How do you find the hidden map name in the BiztalkMgmtDB (BizTalk Database)? If you look at the table names, you will obviously find bt_MapSpec, but it doesn’t contain the map name. The map itself is hidden in the bts_Item table, which you have to join to. I found this on Jeroen Maes Integration Blog. He has a more complex query that finds a map based on the input/output target namespace. He also joins to the bts_Assembly table. My goal was just to list all maps containing some sequence of letters (such as a customer name or abbreviation). I’m surprised there the Type column doesn’t seem to be populated with some number that indicates that the bts_Item is a map, or a schema, or whatever. I have a new application that I’m building. I have for example three projects, App.Common, App.In, and App.Out. We have a somewhat debatable policy of keeping one app separate from the others and almost no application cross-references (still on BizTalk 2010 – but in 2013 this is supposed alleviated, partially or in whole). I had a web service schema copied in to App.Out. And I developed the proof of concept in App.Out. Now, it turns out we have about 6 output messages. There was a also some debate as to whether they should go in the single AppOut project, or in six different projects (App.Out1, App.Out2, etc…). The architect wanted the second approach, so different developers could be assigned to each one in order to possible meet a tight development deadline. Now, I don’t want that same web service schema to be deploy 6 times in the same application. So I moved the schemas to the App.Common. And of course the map doesn’t compile because I change the location of the schemas. I was afraid I was going to have to do map surgery, but it turns out I could just re-reference the schema in the map. Since the schema and nodes are the same, none of the mapping was lost. But for fun, if I had to do map surgery, this is chat change. The Original “Before” is on top, and the “After” is on the bottom”. NOTE: When you open a map there are no line breaks. I use the XML tools in NotePad++ to format the XML (but don’t save it after formatting, always do the formatting on a copy). You can see below how the “Reference Location” attribute changed. I’m mapping from our Canonical schema to an internal web service schema. map_X_to_Y.btm: error btm1023: Exception Caught: Object reference not set to an instance of an object. What I had done was copied a map from one project to another. I had either not copied the schema, or I had copied the map to a different folder where it couldn’t find one of the referenced schemas. So either I moved the map or added the missing schema, and all was well. 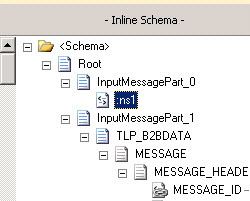 You can see in the picture above that InputMessagePart_0 was missing the schema. MyMap.btm: error btm1023: Exception Caught: The ‘=’ character, hexadecimal value 0x3D, cannot be included in a name. Line 4, position 23. This was a simple typo. I typed in “value-of-select=” instead of “value-of select=” (I erroneously included an extra dash between the “of” and the “select”). The parser saw the entire element name as “value-of-select=”, so of course, you cannot have an equal sign in an element name. You need to use an XSLT Template instead of just inline XSLT because you need to pass a parameter. When using the XSLT Template, you need to connect the Scripting Functoid to a field on the right side of the map; otherwise the Template will never get called. How do you test a multi-part map, i.e. a map with multiple input messages? To test a normal map, you just take an sample XML file, click the map (in Visual Studio Solution Explorer), set the property of the filename into the value of the property “TestMap Input”, then right-click on the map and select “Test Map”. The output is shown in the Output window, and you can do a CNTL-Click on the output file to view the results. You would put your own elements and attribute between Schema1RootElement and it’s closing element, as well as between Schema1RootElement2 and it’s closing element. So normally, you use some text or XML editor (like NotePad++) and paste data samples, then wrap them with the XML element wrappers shown above. So basically the root element is part of a special namespace called the “aggschema” (aggregate schema). Then, as many message as you added each are found, but each is wrapped with N) where N start with 0, and increments once per each message. 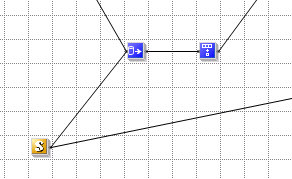 I had a case today where I was mapping two fields N01 and N02 to two side by side fields in the output schema. N01 was working, and N02 wasn’t. Both were under an condition that a certain variable MESSAGE_TYPE was equal to a certain value. Yet one worked, the other didn’t? How did I go about debugging this? I did a right click “Validate Map”, and opened the XSLT. I searched for N01, and found the following. In the image below, I have highlighted some of the code. The N01 is wrapped by one IF statement, so I would expect the same IF statement around N02. But when I look at N02, I see to nested IF statements. You can find the variables to understand what the tests are. So I searched for the extra test around N02, i.e. the variable v16, and found this. That jogged my memory. I had another page on the map, where we were using a “trick” to not map certain fields. This was a RosettaNet schema, and it contained many nodes with default values that were filling up the output document with unnecessary junk. The “trick” is to map “false” to the fields you don’t want to map. So I had essentially told the map that I did not want to output this element (even though I had mapped something to it). Of course, this is only one small case, but I hope you like the methodology, and can use it to apply to your own debugging. Learning XSLT of course helps. The XSLT generated by BizTalk can be a little confusing because of all the “userCSharp” routines, and all the variables, but it can help you find issues in your map while testing. Also note, I would not have found this issue unless I was carefully unit-testing. I hand-crafted 5 different input test files, and was running each one of them through the “Test Map” feature, and manually scanning the output. This apparently happened because the map was copied from one BizTalk Project to another. The new project didn’t have the references set up. So I copied the .DLL to a Libraries subfolder, then in Visual Studio Solution Explorer, I clicked on “References” under my project, and added the reference to the .DLL. Then next time I opened that scripting functoid, the fields were all filled in properly. Apparently that .DLL was in the GAC, which is why the compile/deploy worked. The C# code below, uses the registry to get that server name, and also builds a connection screen to some database on that server (where you pass the Database Name as a parameter). MgmtDBServer (in the rk.GetValue below), referes to the BizTalkMgtmDB. Here’s one example how this could be used. Suppose you have a database that contains lookup tables, and that database is on the same SQL server as the BizTalkMgmtDB database. The Scripting Functoid below calls the C# to get the connection string, and becomes the second parameter to the Database Lookup Functoid. 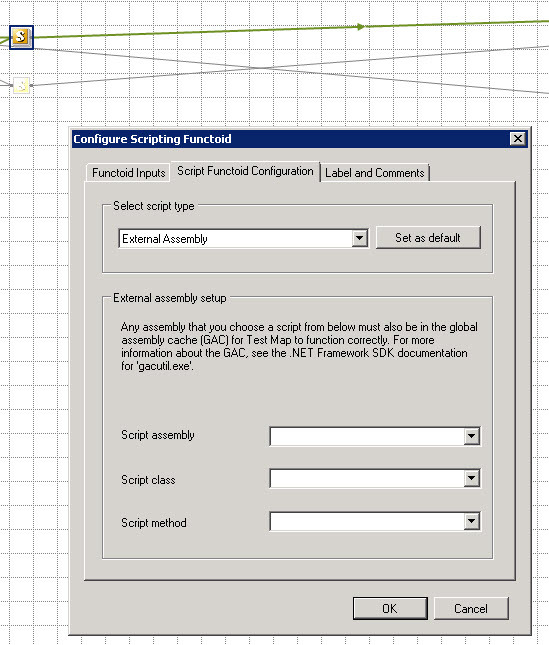 The scripting functoid is setup as shown in the picture below. First, make sure you reference the .net assembly created from the C# code above. 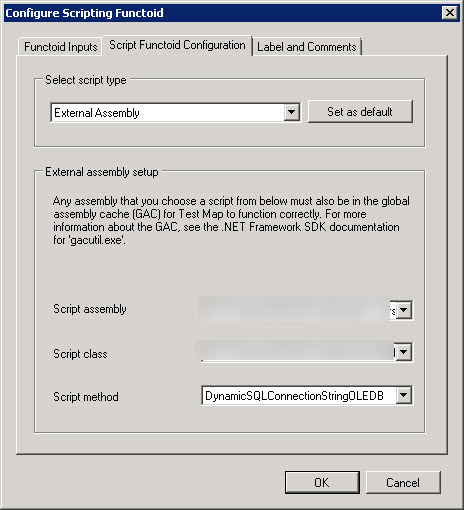 Then select that in “Script Assembly”, and pick the class in “Script Class”.